Prix indicatif par chambre pour une nuit. Planning to explore the Loire Valley chateaux or Anjou vineyards, or enjoy cultural events in Angers? Perhaps you are in Angers, in the Maine-et-Loire region, for a seminar or trade show? Why not stay at Saint Julien Hotel! Recently under new management, this three-star hotel features spacious, comfortable rooms. Some boast a lovely private patio looking out onto Place du Ralliement. Located on a pedestrian square, Saint Julien Hotel is a peaceful haven that remains within easy reach of restaurants, shops, theatres and more. The tram and bus networks provide easy access to the train station, hospital and university. Located just opposite the Angers Theatre, in the centre of town, only a stone’s throw from the tram line and Boulevard Foch, and within easy reach of the train station, Saint Julien Hotel is ready to welcome you. Whether you are travelling for work or with family, our team is here to make your stay in Angers memorable! During your stay, enjoy a continental breakfast every morning served on the ground floor. We have also joined with Provence Caffé to offer half-board dinner packages. This restaurant adjoins our hotel and serves Mediterranean home-made cuisine. For dinner in your room, our team offers Meunier room service meals. To make your stay even more enjoyable, Saint Julien Hotel in Angers offers fibre internet. 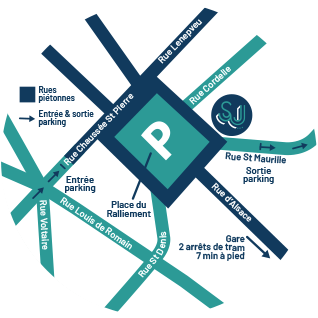 The Ralliement car park is nearby, where you can easily park your car for only €2 per night (day rates available from reception). Your pets are also welcome! The Angers region has a rich heritage. Come discover it! To restore you, we offer Meunier dishes, served in verrines and heated by steam. You are rather soup, pasta or even veal blanquette, a wide range of dishes is available at the reception. Please dial the 9 and your menu will be served in your room in 20 minutes.